Bowfishing for tilapia on lakes and rivers around Texas is a challenging and fun sport equivalent to coming face to face with a Rio Grande turkey or whitetail deer in to woods. Tilapia are sensitive to movement and can disappear like a ghost in the water but they are also curious. This combination of characteristics makes bowfishing for tilapia among one of my favorite outdoor pursuits. Tilapia are usually found in the southern United States as well as Central and South America where the climate is warm. Since they tend to thrive in warmer bodies of water, power plant cooling lakes are among the best places to find tilapia. The author and a large tilapia from Lake Dunlap. Although buffalo and many species of gar are native to Texas waters, they are considered “rough fish” as they are non-game species and not considered popular for eating. Buffalo and carp often forage for the same food sources so they can be found in good numbers together. Gar prefer live fish so they can be found near the surface, especially at night, looking for shad, bluegill or other small fish to feed on. Being a very long but not very wide fish, gar can be a challenge to shoot but that is what we are after here, right? A fish often looked over in bowfishing is the Gaspergou, also known as the freshwater drum. These fish can be found in many of the same place buffalo and carp roam and are a good table fare consideration as well. Bowfishing for tilapia is comparable to turkey hunting in that tilapia can see very well and will bust you if they catch you even slightly moving before you make your shot. They are simply there one minute and gone the next, leaving a cloud of mud behind after they quickly swim away. Most bowfishers would tell you the daytime is the best time to go hunting after these fish. On clear water rivers and lakes tilapia are relatively easy to see but you can see even better with the aid of a good pair of polarized sunglasses. The only issue with clearer bodies of water is that, though you can see the fish easier, they can see you too! 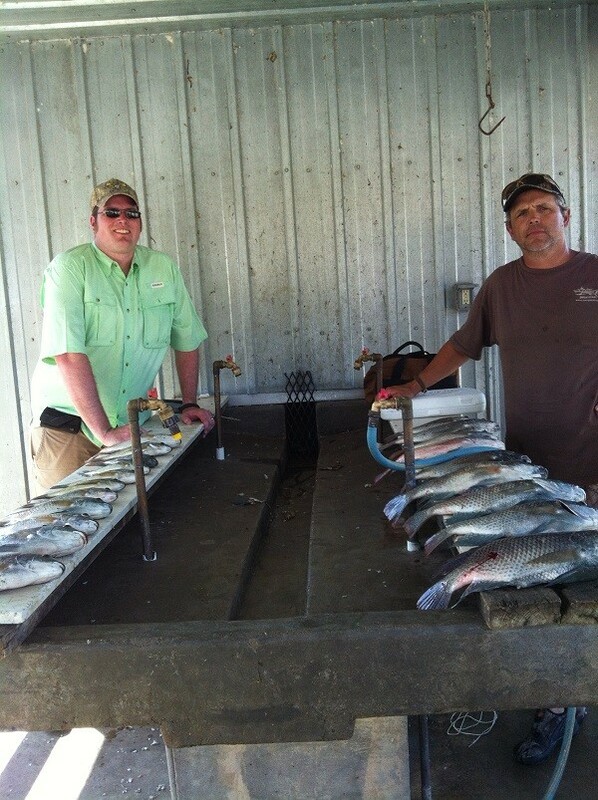 The author and his friend Marty McIntyre and their tilapia haul from a day bowfishing Lake Fairfield. You can bowfish for these fish by trolling around the edges of the lake 2-7 feet of water, much like bowfishing for other species of fish. Go slow and keep your eyes open for them. My main strategy for bowfishing is to pull up into a patch of aquatic vegetation and find an area where there is a clearing and relatively calm and clear water. Anchor your boat and wait, with your bow in hand, ready to draw at any second. These fish will typically peek out of the vegetation to look at you, exposing an easy shot. The minute you see one come out of the vegetation or close to the surface for a look, shoot! However you choose to approach bowfishing for tilapia, you are most certainly going to have fun doing it. I assure you that the adventure is well worth the trip if you have tilapia near where you live or can travel to a place that has them. Remember to aim low, think big, and have fun out there!